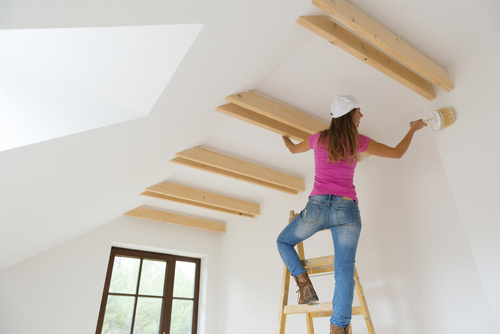 Deciding to update the paint inside your home can make the entire property look larger, cleaner, and more inviting. According to the residential painting contractors at Genesis Pro Painting in Bedford Hills, NY, you should put considerable thought into what paint finish to apply in each room, as some are formulated to hold up in certain environments better than others. To ensure you pick the right products for your project, Westchester County’s premier residential painting contractors share insights on what finishes to use in different rooms of a house. Satin finish has a noticeable sheen, which adds vibrancy to home interiors. Because it is resistant to stains, you should use the finish in high-traffic areas of the house, such as the living room, kitchen, or dining room. If children constantly leave smudges on walls, consider using a satin finish in bedrooms, too, as it only requires a wet towel to remove traces of grime. Bathrooms hold a lot of moisture, which means some finishes will bleed when exposed to high levels of humidity. In these rooms, it’s best to apply a semi-gloss finish, as it effectively repels water. The finish also reflects light when dry, which will make a tiny bathroom appear more expansive. If you have a finished basement or additional rooms with brick or concrete walls, paint finishes with shine will pull focus to rough patches and other imperfections. Instead, bathe the surfaces in paint with a flat finish. When dry, the paint has a matte appearance, which is great at hiding cracks and other marks on the surface. Although you can try your hand at interior painting, the painters at Genesis Pro Painting have the tools and experience to deliver professional results. To schedule an interior or exterior painting service appointment in Westchester County, call (914) 579-2110 today. A representative will answer questions and fill you in on how to prepare for the project. Visit the residential painting contractors online, and follow them on Facebook to see pictures of their work. What Prep Work Is Involved Before Exterior Painting?